No construction project manager ever wants to think about their crew members getting injured on the job. But it can – and all too often does – happen. Highway zones are some of the most dangerous construction sites because the crew is at risk from motorists as well as all the usual worksite hazards. More than 96,600 crashes occurred. That was up 7.8% over 2014. Another crash happened every 5.4 minutes. 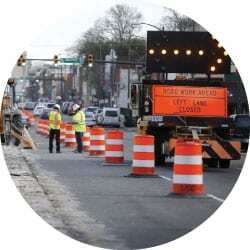 70 work zone accidents resulted in at least one injury every day. 12 work zone crashes killed at least one person, every week. In fact, fatalities are happening more often. There are not only more accidents, but more of them are also life-threatening. Today’s road projects often cover much larger areas. That requires larger crews, including more people working near diverted traffic. Today’s motorists are far more distracted – texting, talking their cell phones, etc. Truck drivers may also be inattentive due to distractions or fatigue. Almost every industry is suffering from a labor shortage these days, but construction is among the hardest-hit industries. It is imperative that companies retain the workers they have now as well as doing everything they can to attract new hires. Would you rather work for a firm that has a great safety record, or one with a shaky record? Unimpressed employees can easily take their skills elsewhere. You could lose bids as well as workers if your company has a less-than-stellar safety record. That’s because an increasing number of contract-letting entities are using safety records as one of their selection criteria, rather than simply looking for the lowest bid. Expanding and/or upgrading safety efforts (and promoting that fact) could sharpen your competitive edge. Construction employers have long used multiple means to train their people on safety. Technology now enables you to expand access to training, via web-based instruction, video-conference workshops, smartphone apps workers can access on the job or anywhere else, etc. Because safety is so important, you have more partners to help with training, too, thanks to programs available through trade unions, industry associations, insurance companies, specialized consultants, and even manufacturers of personal protective equipment (PPE). But there’s more. Communications devices help workers stay in contact with one another, especially with they are out of sight. Wearable technology enables project managers to track every individual as well as every piece of equipment. GPS enables you to limit access to certain areas. Cloud-based software applications make recordkeeping easier, more accurate, and current. You can use a single system to monitor training as well as PPE usage and maintenance. PPE itself is becoming tech-forward, as manufacturers use advanced materials and designs to make wearables more comfortable and more durable. Perhaps even better, technology may one day soon be able to replace humans in the most dangerous positions. Removing people – primarily flaggers — from these areas is a surefire way to protect them from injury or death. And it frees up those people to perform other tasks instead, increasing overall jobsite productivity. New technologies can cost more, but it’s an investment in human lives as well as greater productivity. That could be a pretty impressive payoff. And, until project designers come up with a way to entirely separate motorists from road project workers, technology improvements will continue to be one of the most effective ways to protect people and realize better safety records.